The Winnipeg Jets finish a three-game road trip in the Atlantic Division today against the Buffalo Sabres…The Jets have lost both games of the road trip so far, including 5-2 to the Ottawa Senators yesterday…After today’s game, the Jets begin a three-game homestand with a meeting against the New York Rangers on Tuesday. Yesterday and today marks the eighth of 10 back-to-back sets the Jets have this season…Winnipeg is 4-4-0 in the first game and 5-2-0 in the second game of back-to-backs this season…Last season, the Jets went 4-3-2 in the first game of nine back-to-backs and 4-4-1 in the second game…The Jets have outscored their opposition 26-22 in the second game of back-to-backs…Four players are averaging a point per game or better in the second game of back-to-backs this season. The Jets are 3-3-0 in day games this season and have outscored their opposition 22-17…Winnipeg’s power play is 33.3% (7-for-21) in afternoon games…Josh Morrissey leads the Jets in scoring in day games with nine points (3G, 6A) in six games, while Tyler Myers has six points (3G, 3A). The Jets have given up five goals against in back-to-back games for the first time this season…Winnipeg had previously gone 29 games of allowing four goals or less…The last time the Jets allowed five goals or more in back-to-back games was Dec. 5-7/17. The Jets have lost three in a row for the first time this season, but did get a point in an overtime loss against San Jose on Tuesday…The Jets haven’t lost three games in a row in regulation since Mar. 6-11/17…Winnipeg has since lost back-to-back games in regulation on 10 occasions, including its past two games. The Jets are 14-12-0 on the road this season…The Jets are 3-2-1 in their past six road games and haven’t lost three consecutive road games in regulation since Dec. 10-20/16…Blake Wheeler leads the Jets in scoring on the road this season with 24 points (3G, 21A) in 26 games. The Jets are in a stretch of 11 games (3-3-1) in 20 days…Winnipeg went 6-3-0 in nine games in 16 days leading into the break…The Jets are in the midst of playing their last 34 games of the regular season in 69 days. The Jets are 13-8-1 against Eastern Conference teams this season, including 5-5-1 against the Atlantic Division…Winnipeg is in a stretch of seven of nine games against Eastern Conference teams…Winnipeg went 19-7-6 against the Eastern Conference last season, including a 10-3-3 record versus the Atlantic Division and 9-4-3 record against the Metropolitan Division…Blake Wheeler leads the Jets with 25 points (2G, 23A) in 21 games against the Eastern Conference, while Mark Scheifele has 24 points (13G, 11A) in 21 games. Winnipeg has scored four goals or more in 10 consecutive victories and in 16 of their past 17 wins…The Jets are averaging 4.6 goals per game in wins this season, which is the second most in the NHL…Meanwhile, the Jets have been limited to two goals or less in 11 consecutive losses and have been outscored 39-14 in those games…The Jets have held their opposition to four goals or less 49 times this season, which leads the NHL…Of the 55 games the Jets have played this season, 34 have been decided by two goals or more. Brendan Lemieux has scored in back-to-back games and three of Winnipeg’s past four games…Lemieux has scored nine goals this season and has tallied six of them in his past nine games…He’s scored six of his nine goals in the third period…With his next goal, Lemieux will become the ninth member of the Jets to reach double digit goal totals this season. The Jets have points in three consecutive games against the Sabres (2-0-1) after losing four consecutive games during the 2015-16 and 2016-17 seasons. The Jets are 11-5-2 against the Sabres since the franchise moved to Winnipeg in 2011. Winnipeg is 5-for-12 (41.7%) on the power play in their last four games against the Sabres. The Jets are 16-for-18 (88.9%) on the penalty kill in the last six games against Buffalo. Bryan Little leads the Jets in scoring against the Sabres with 25 points (10G, 15A) in 29 games. Mark Scheifele has eight points (4G, 4A) in eight career games against Buffalo. 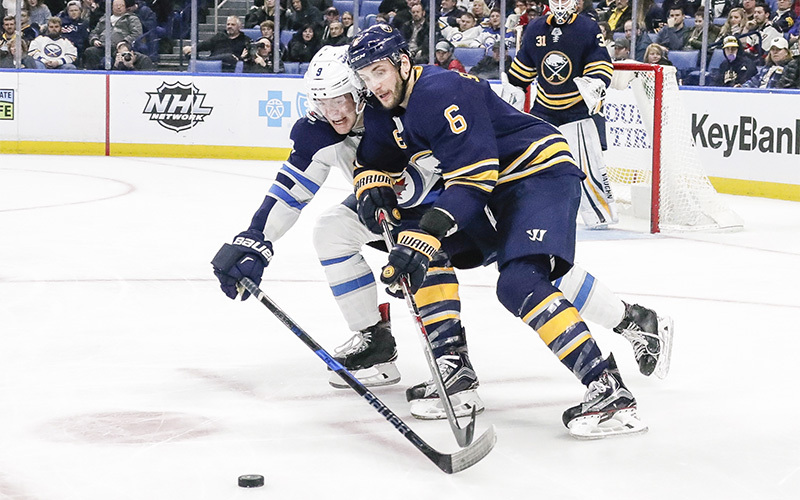 Jets Tyler Myers, Brendan Lemieux and the draft pick used to select Jack Roslovic were acquired from the Sabres as part of a seven-player trade on Feb. 11/15 that sent current Sabre Zach Bogosian to Buffalo. Jets defenceman Dmitry Kulikov played 47 games with the Sabres during the 2016-17 season. He signed with the Jets as a free agent on July 1, 2017. Sabres head coach Phil Housley played 232 games, tallying 259 points (62G, 195A), with the Jets 1.0 from 1990-93 and was acquired from the Sabres in the Dale Hawerchuk trade. Sabres GM Jason Botterill played 25 games with the Atlanta Thrashers during the 1999-00 season. He was drafted by the Brandon Wheat Kings in the second round of the 1991 WHL Bantam Draft, but elected to play at the University of Michigan, which is the alma mater of current Jets Jacob Trouba, Andrew Copp and Kyle Connor. At the 2016 World Cup of Hockey, Winnipeg’s Patrik Laine played with Buffalo’s Rasmus Ristolainen for Finland, while Winnipeg’s Mark Scheifele and Connor Hellebuyck played with Buffalo’s Jack Eichel for North America. Jets Jacob Trouba, Andrew Copp and Connor Hellebuyck played with Sabres forward Jack Eichel for USA at the 2017 World Championship.